5 Stars Train Ho Chi Minh – Thap Cham – Nha Trang – Stretch out in style and enjoy the comfortable seats and clean toilets on the nine-hour journey. 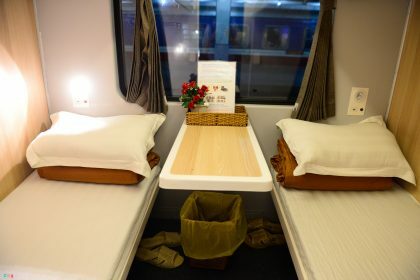 Saigon Railways rolled out a luxury new train route between Ho Chi Minh City and the central tourist town of Nha Trang on Wednesday, offering comfortable seats, spacious luggage compartments and clean toilets. The trains also have sleeper sections, but standard seats can be put back so passengers can lie down. There is enough space for passengers to put their seats back so they can lie down. Tinted windows deflect the glare of the sun, and the trains have shock absorbers to ensure a smooth journey. The trains leave Ho Chi Minh City every day at 8:30 p.m. and Nha Trang at 7:10 p.m. The journey takes around nine hours. Nha Trang is around 450 kilometers (280 miles) to the northeast of Ho Chi Minh City and can also be reached by flights to Cam Ranh Airport. The beach town is popular among many local and foreign tourists and helped draw more than one million foreign visitors to Khanh Hoa Province in 2016, up 21 percent from the previous year.